← What Was Ponzi’s Scheme? How much longer will there be a demand for Elvis impersonators? It was 1977 when the original Elvis Presley died (or disappeared, as conspiracy theorists assert), but almost 40 years later, he’s still the subject of these “tributes”. There are people who weren’t even alive in 1977 who go to Las Vegas and have their marriage solemnized by a guy with a greasy pompadour and a sneer. Elvis is probably the most impersonated celebrity, but the most successful impersonator in recent history didn’t “do” Elvis. Even if you were listening to comedy several decades ago, you probably remember this entertainer only dimly. Does the name Vaughn Meader ring any bells? Meader was a piano player who became a standup comic. He worked into his act some bits as the newly elected president John F. Kennedy. A native of Maine, Meader’s natural accent only had to be tweaked slightly to become an excellent simulation of JFK’s speech patterns. In 1962, He and several other performers recorded an album called “The First Family”. Meader did Jack Kennedy, and an actress named Naomi Brossart voiced Jackie Kennedy; if you listen to the album now, you’ll be struck by how relatively tame the humor was. The theme was basically that the family in the White House was pretty much like every family, so there were jokes about the children’s bath toys and relatives dropping in and why the President wasn’t eating his salad. “Well, let me say this about that,” Meader, as Kennedy, intones. “Now, number one, in my opinion the fault does not lie as much in the salad as it does with the, uh, dressing being used on the salad. Now let me say that I have nothing against the dairy industry…” And so on. The album’s phenomenal success swept Vaughn Meader to stardom; he was booked on the Ed Sullivan Show and other variety shows and became a headliner in Las Vegas, raking in over $20 grand a week, back when that was serious money. Another album, “The First Family Volume Two”, was released in the spring of 1963. 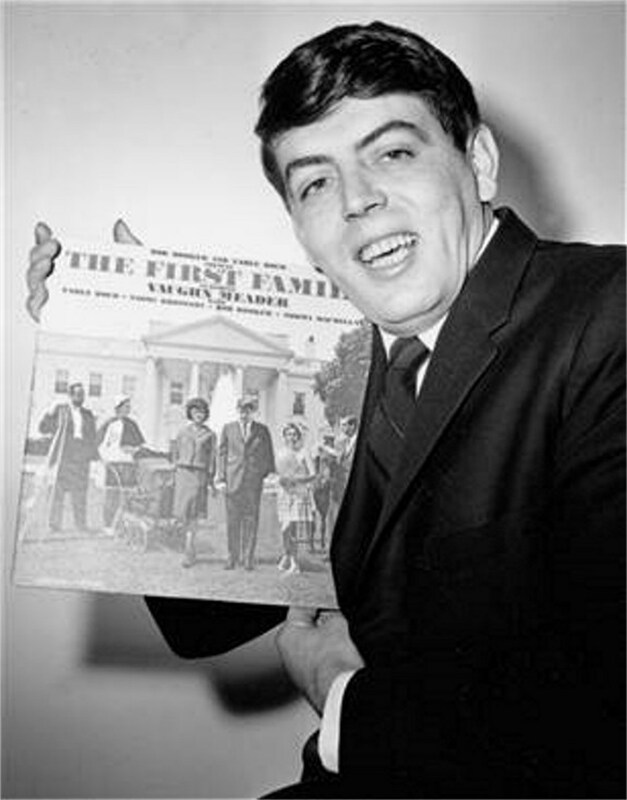 Vaughn Meader was in his mid-twenties and had reached the pinnacle of show-business success. Then, on November 22, 1963, President John F. Kennedy was assassinated. The “First Family” albums were pulled from store shelves. Gigs that had been booked were canceled — suddenly, no one wanted Vaughn Meader. Apparently in the collective consciousness, he was a reminder of the tragedy. Meader released a couple of more albums that did not have any Kennedy-related material, but they didn’t sell. Within a few years, he was grinding out a living playing piano in small venues — taverns and such. His fame had lasted almost exactly one year, and then Vaughn Meader plummeted into obscurity. This entry was posted in History and tagged "The First Family", celebrity impersonators, Vaughn Meader. Bookmark the permalink. What a fascinating post! Poor Meader. I suppose impersonating the Johnsons wouldn’t have been the same. You’re right — to my knowledge, no one rocketed to fame by impersonating Lyndon Johnson. There was a comedian named David Frye who did a passable Johnson, but he is best known for building an act around his Richard Nixon impression. Frye didn’t achieve the same level of celebrity as Vaughn Meader, but he did stay in show business quite a bit longer — he worked night clubs in Las Vegas for decades. Very interesting. I do recall The First Family album. We had a copy in our house. After reading your post, I checked out Amazon and ordered a CD of the Meader hit. It was $8.29. A bargain, for sure. Interestingly, today it’s priced at $10.99. I imagine it’s because of your post. Hey, why not? I did some additional reading – looking for info on a comedy album that was called “Naked, Really Naked.” I discovered it was done by Alen Robin and a First Family alum, Earl Doud. The short post I read also stated that Robin put out an album called “Welcome to the LBJ Ranch” in 1967 which turned out to be the 2nd biggest selling comedy album of all time. Right behind The First Family. Before venturing into comedy recordings, Robin was the head writer on The Tonight Show. I do not recall the LBJ album, but in ’67 I was busy in a foreign land where comedy albums were non-existent. I imagine you were too. At any rate, thanks for the reminder of Mr. Meader and the Kennedy clan. I do enjoy listening to it again. I don’t recall that LBJ Ranch album either, Gary. Obviously it did very well, but it’s hard to imagine that it sold more copies than some of the albums Bill Cosby did around that same time. It seems to me that Stan Freberg’s album “The United States of America, Part One” was a hit record, too. By the way, that’s one of the things I was doing in 1967 (or possibly 1968) — I was a student at USC and took a class on comedy from Stan Freberg. My turn in olive drab came a little later. Thanks for taking the time to do the research. I appreciate your comment! Hire Top rated Elvis Impersonators in Las Vegas. Are you looking for a way to Increase your Events Heat. Then consider hiring Elvis Impersonator to Lift up your Events!